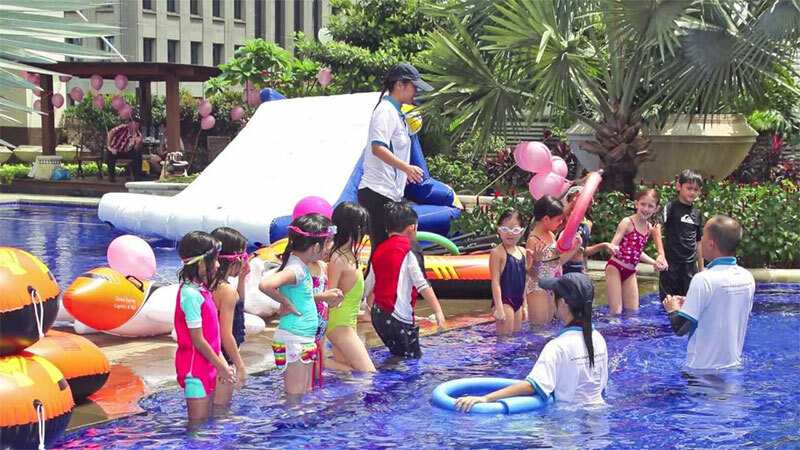 One of the best ways to have a great pool party for kids is by playing some great games in the water. Children will eventually get tired of just swimming, so these games are a great way to keep the party going with very little trouble at all. This is by far one of the most popular games in the pool. One person is “It”, closes his or her eyes, and counts to 10. The rest of the kids move around the pool to hide. After ten seconds, the person who is “It” shouts, “Marco”. The rest of the kids say, “Polo”. The child who is it then follows the voices to find the hiding kids. For an added twist, kids can say, “Pumpernickel.” This tells “It” that the player is going under the water. To prevent cheating and potential arguments, you can use a black permanent marker to color in a set of goggles that “It” must wear. The game requires you to cut regular pool noodles into sections that are one or two inches long. Sam from Gaming Weekender thinks it’s a good idea to make about 20 pieces for each child in the game. Start out the game by having all kids move to the edge of the pool. You then dump all the noodle pieces in the middle. The kids must go get one piece at a time and return to where they started. With each piece, they will begin stacking them on the edge of the pool. Once all the pieces are gone, count to see who has the most stacked. This game is played like musical chairs. Children walk or swim around the exterior of the pool. In the middle, you should put any items that will float. To keep them in the middle, you may want to put them all on a raft or other device. You want to have one less item than there are kids. So, for five kids, you’ll need four items. Play your favorite music. When you stop the music, kids race to the middle to get one of the items. The child who doesn’t get an item is out of the game. Choose three or four words that the kids can spell. Write each of the letters that spell the words on a ping pong ball. Use enough ping pong balls for every child to spell each word. If the words are “fun”, “swim”, and “shark”, you would need 12 balls per person. Once you have the balls ready, give each child a bucket to put by the side of the pool. They will then have to go and find each letter of the word, one at a time. Once a letter is found, it is returned to the bucket. The first to spell all the words wins the game. For more advanced play, give kids the chance to trade a bucket. To do this, you should have two extra ping pong balls that say “Trade”. Once one of these is found, it must be played immediately. Each child will have a bucket that must be filled to a certain point with water from the pool. To get the water in the bucket, kids must fill a plastic drinking cup with water from a designated spot in the pool. They will then race to this location to fill up the cup and return to fill the bucket. The other players try to make him or her spill the cup before returning to fill the bucket. The first person to fill the bucket is the winner. This game can also be played in teams for more intense action. Pool games are a great way to liven up any pool party, so use your imagination to add some of your own flavor to these five festive fun pool games.